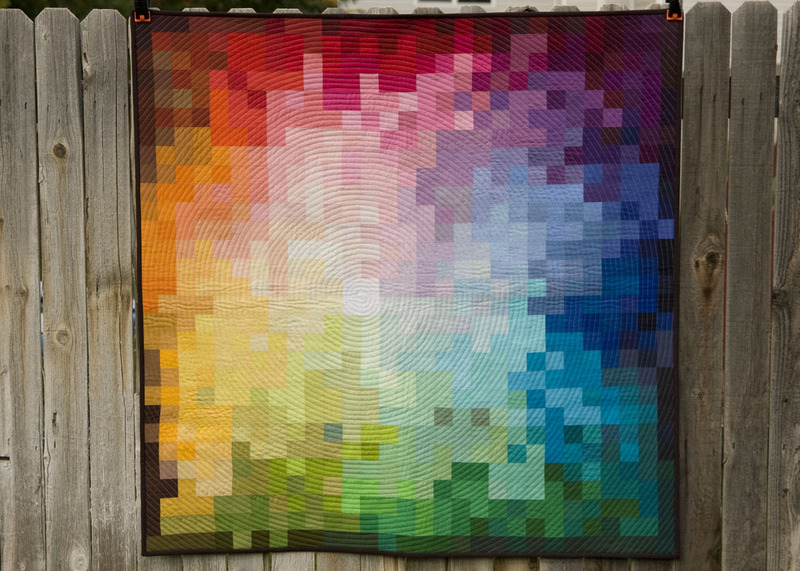 I'm a bit late on this one, but I wanted to share that my color wheel quilt was featured yesterday over at the 100 Days of Quilts on the Modern Quilt Guild. I'm so flattered that they included two of my quilts in the festival of modern quilting. There have been so many great quilts so far. I can't wait to see what's to come. This quilt still blows me away and for a couple of reasons. One that you could see the vision and turn it into reality and two, that you own that much solid fabric! Lucky, clever girl. Well done on the feature. Wowza, what a beautiful quilt! This is an amazing quilt. What was your strategy in putting the squares together? All the colors flow so well. Nice job! That is one fanastic quilt! 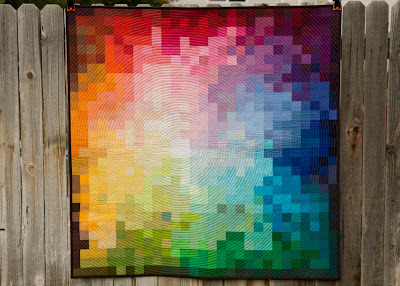 I absolutely adore that quilt, and I was super psyched when I saw it pop up on the MQG blog!! Yay you!! As I said over there, this is one of my very favourite quilts in the history of, like, forever. The play of colors is fantastic. I struggle with color so it really impresses me when I see what others can do. Seriously - it's a work of art! that is truly a stunning piece of quilt n art, you are incredible! It`s so stunning - I may have to shamelessly copy you with my beautiful color wheel charms. No surprise here it was included - unbelievably stunning. Congratulations on your feature! That is an amazing quilt! Woah. This quilt is pretty much the most amazing thing ever.